I’ve worked in dysfunctional offices that had terrible morale, and I’ve been lucky enough to enjoy the opposite type of environment, where merit-based workplaces rewarded creativity, loyalty, and hard work. It should be no surprise that the more positive work environment created a more successful, sustainable business. I bring this up because the Oakland A’s are a great example of this. The current regime is rebuilding the franchise and rehabilitating its reputation, showing that a positive approach, offering a friendly, secure climate to both its employees and customers, often yields the best results. 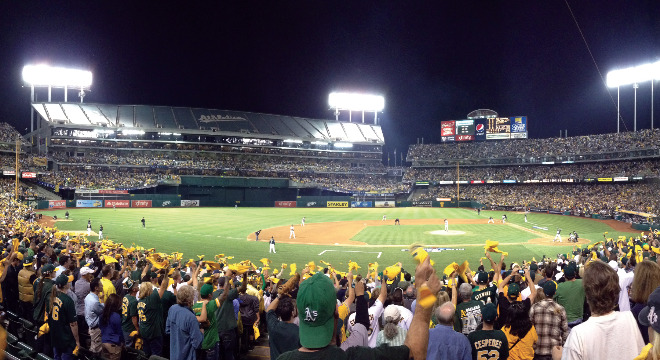 Ever since Dave Kaval took over as president of the A’s in late 2016, the franchise’s front office has relentlessly sought to improve relations between the team, the East Bay community, and its fans. Kaval & co. have embraced the city of Oakland, improved the Coliseum’s game-day experience in ways big and small, and moved the A’s offices to Jack London Square, closer to the heart of the city. The team’s latest fan-friendly effort was announced July 30, unveiling the new “A’s Access” ticket plan. It’s an innovative, flexible reinvention of the season ticketholder concept. The plan should be especially appealing because it so clearly contrasts with the rigid, almost anti-fan approach the franchise took with customers under past ownership regimes. Under the plan, membership can be had for as little as $240. Also, even a 10-game package in 2019 gives fans access to all other 71 home games by allowing them full entry to the Coliseum’s Treehouse zone. The plan also comes with steep discounts on parking, concessions, and team merchandise for next year’s home games. To nobody’s surprise, “A’s Access” has been an immediate hit with fans. Perhaps it’s no coincidence, then, that the A’s are enjoying success on the field this year, too. It’s one of several local examples of a sports franchise aggressively giving its fans and home city reasons to be proud, and then translating that positive energy into wins on the field. The A’s of the Walter Haas era enjoyed a similar transformation 35 years ago. So have the Warriors of the current Joe Lacob/Peter Guber era. Compare the grim Bob Lurie/Candlestick Park Giants of the 1980s to the Larry Baer/Peter Magowan-led team that moved into AT&T Park in 2000 (when it was originally known as Pacific Bell Park); San Francisco since then has nearly been a perennial contender. You get the point. Sure, shrewd player personnel decisions and smart front-office leaders are key factors. But unless an organization cultivates a human element and has all hands pulling in the same direction, then it’s not going to achieve very much. The common phrase for this is “clubhouse chemistry” — a concept many MLB execs and fans dismiss because it’s immeasurable. And in this age of “Moneyball” analytics, many believe something can’t be real if it can’t be measured by a statistical category. But A’s players believe in it. Which is half the battle. Oakland baseball fans are believers, too. After three losing seasons, A’s fans have been pining for respect from the media and other fan bases, as well as for the chance to root for a consistent winner. This year, fans have been granted their wish on both counts, as the A’s look primed to earn their 19th postseason berth since 1971. Call it what you want — chemistry, mojo, positive energy, or whatever — the A’s have been planting seeds of the stuff, with basic but fan-friendly concepts like the “A’s Access” ticket plan. I fully expected those seeds to come to positive fruition one day, I just had no idea they would sprout this early. About the Raiders … In contrast to the roots the A’s are deepening in Oakland, the Raiders are entering perhaps their last season in the East Bay. The Raiders this fall will offer not pride or positives for the East Bay, but rather a situation that’s both awkward and sad. Seven months after head coach Jon Gruden’s press conference announced his return to the Raiders, I still find it hard to believe that he spurned several coaching offers over the span of a decade just to come back to this wildly uncertain, deeply flawed Silver-and-Black situation. Reggie McKenzie, the Raiders’ general manager since early 2012, must receive most of the blame for the franchise’s dreadful 36-60 record during his tenure. Many of his free agent signings have been expensive disappointments. The majority of his draft picks have been busts. And his stewardship of the salary cap has been subpar. For example, why did McKenzie spend 2012-13 clearing out bad contracts signed by the late Al Davis if he was going to find himself back in salary cap hell just a few years later? Even when McKenzie occasionally scores big with a great draft pick, such as first-round stud Khalil Mack in 2014, he’s been slow to reward such a player with a properly lucrative contract. Mack has stayed away from the Raiders’ training camp while holding out over a contract dispute. He’s been the team’s best player on the field and a model citizen off the field. Yet, McKenzie and the Raiders are not willing to pay him a star’s salary. That McKenzie still has his Raiders job is perplexing; much like the team’s impending move to Vegas.